With Dual USB Ports Charger, LED digital display screen and Built-In Mic, give you a safer, more flexible and convenient driving experience of hands-free calling, music enjoyment, quick charge. High-performance Wireless Device:Built with a high-performance microphone, with Echo Cancellation and Noise Reduction technology offers you a crystal clear calling and safety driving. Two Music Play Mode:( Bluetooth Connection with your phone or Insert USB Disk into the right USB Port) let you be absorbed in music playing when driving. Faster Charger:Built in dual USB ports car charger, automatically detects your devices and charges all types of cellphone or ipad and shows current voltage of the storage battery of your car about 5 seconds when the FM transmitter is power on. Potable&Convenient :Super compact and portable design with LED blue digital screen display of FM frequency and car voltage, provides you portable driving travel experence. Memory Function:Once paired, Auto-connect next time. NOTE:Tune it to an unused frequency and change another stable channel if it has a lot of static because of frequency conflict. [BROAD COMPATIBILITY] - Work with Bluetooth enabled devices, like iPad, iPhone, iPod, HTC, Galaxy, Blackberry, MP3 Players, Smartphones. 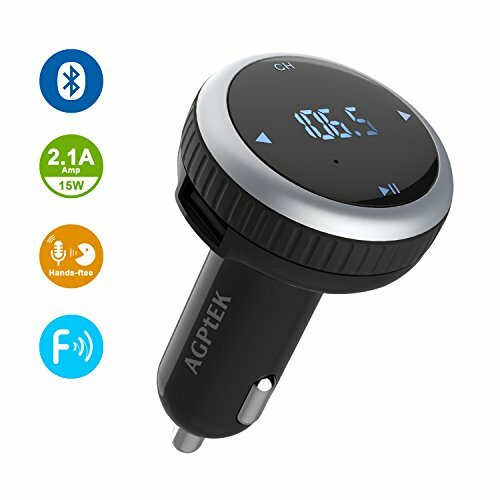 Suitable for all kinds of cars, changes your old car into a Bluetooth Function Car. [SMALL SIZE, 2 PORTS USB CAR CHARGER] - With Two 5V-2.1A USB charging port to charge most electronic devices ,which is much faster than the other car charger/support charging two devices simultaneously, better-charging performance! [Wider FM RADIO frequency range] from 87.5 to 108.0MHz is wider than what ordinary transmitters are of (88.1~107.9 MHz), which means you will get a frequency without interference more easily and do not have to keep re-tuning it. [ANSWER CALLS HANDS-FREE] AGPTEK KM18 utilized most advanced interference and noise cancellation technology, grants you crystal clear call. Answering/redialing/dismissing or ending a call just simply click a button. Seamlessly switches between incoming calls and music; Drive more safely. [IMMERSE IN HiFi MUSIC:]Insert a USB flash drive which contains MP3 files into the "RIGHT" USB port and enjoys it. If that's not enough, it can also support your playlist with a full range of audible frequencies with no distortions of the original signal from your MP3, iPhone, Android Smartphones and more Bluetooth enabled devices.